Posted on November 27, 2016 by Worth Stopping By . . . Here is a perfect recipe for the weekend after Thanksgiving. It involves a homemade turkey broth, so I suggest that you approach this one in stages. Make the broth and prep the potato patties one day, and finish up the next. A super way to use the turkey carcass and some of the leftover veggies, potatoes, and gravy. Posted on April 26, 2016 by Worth Stopping By . . .
What a wonderful treat this Italian soup was — and ready in only 30 minutes! It takes one bag of baby spinach, two cans of fire roasted tomatoes, vegetable stock, orzo, and some chopped veggies to create this fantastic soup. I topped each serving with some homemade croutons that I had on hand. I like to freeze a quart or two every time I make a pot of soup. It is so easy to take some out and put together a healthy meal on evenings when you are short on time. Posted on April 12, 2016 by Worth Stopping By . . .
Purely American is a little company out of Norfolk, Virginia that provides my favorite bean soup mixes — all natural, no additives. The “Bridges of Ashtabula” is a hearty nine bean soup mix that celebrates Ashtabula County, Ohio — America’s covered bridge capital. Each soup mix comes with a wonderful recipe attached that turns the beans into something beautiful. We used the bone from our Easter ham along with crushed whole tomatoes, onion, celery, garlic, potatoes, sweet corn and a nice, fat chicken breast to create this heart healthy, high fiber, low fat soup. To get the best result, purchase a can of whole skinless tomatoes, drain the liquid into your soup pot and crush the tomatoes in your hands right into the pot. Feel free to use any bean mix that you have on hand, but check out the wonderful selection that Purely American offers. A perfect meal for a breezy Sunday. Sort through and thoroughly wash beans. Soak beans four hours or overnight in water to cover by 2 inches. Drain and rinse the beans. In a large pot (6-8 quart capacity) combine the beans, 2 qts. of cold water, black pepper, ham bone, and Bouquet Garni. Cover and bring soup to a boil. Lower heat to medium low and cook 1 hour. Add salt, tomatoes (including all the juice), onions, celery, garlic and chicken breast. Cover and bring the soup to a boil. Reduce heat to medium low and cook for 1 hour, stirring occasionally. For the best flavor, prepare onions, celery and garlic just before adding them to soup. Add potatoes and corn. Cover and bring the soup to a boil. Reduce the heat to medium low and cook for additional 30 minutes. Remove ham bone and chicken onto a cutting board to cool. Carefully locate and discard bones and fat. Dice meats fine and return them to soup. Remove and discard Bouquet Garni. Posted on March 25, 2016 by Worth Stopping By . . .
Irish bacon is cut from both the pork belly and the loin producing lean, meaty pieces. This type of bacon is not readily found here in the South so I used a lean, uncured center cut bacon instead. The preparation of this soup moves along quickly with a nice hot bowl ready in about an hour. I found that I really needed closer to three cups of chicken broth instead of the one cup as listed below. I used one cup to deglaze my stock pot to incorporate all of the bacon bits into the mix and the other two to bring the liquid level up to cover all the goodness. The end result is a flavorful and hearty soup — a delicious way to celebrate St. Patty’s Day. Perfect served with a thick piece of toasted bread. Posted on January 15, 2016 by Worth Stopping By . . .
A good pot of soup is a great vehicle to use up some of the leftovers and extra ingredients after the holidays. Of course, I want to put the bone from our Honey Baked ham to good use — this year it is in a Country Style Bean Soup. Soak about 2 cups of your favorite bean mix for a few hours before adding it to your stock pot with fresh spring water, a ham bone or ham hock, freshly ground pepper and a bouquet garni. Over the course of the next couple of hours you will add chopped celery, onion, whole peeled tomatoes, garlic, corn, diced potatoes and a chicken breast. Once everything has had a chance to cook up the ham bone and chicken breast are removed, and the meat is diced and returned to the pot. I think my favorite thing about making this soup is the enticing aroma that fills the house. Of course, we think that this soup is even better the next day, and I always freeze a quart or so to enjoy on a cold, winter evening. Drain and rinse the beans. In a large pot (6-8 qt. capacity) combine the beans, 2 qts. cold water, black pepper, ham hock and bouquet garni. Cover and bring soup to a boil. Lower heat to medium low and cook 1 hour. Add salt, tomatoes (chopped, including all the juice) onions, celery, and garlic. Cover and bring the soup to a boil. Reduce heat to medium low and cook for 15 minutes, stirring occasionally. For the best flavor, prepare onions, celery and garlic just before adding them to soup. Add potatoes, corn and chicken breast. Cover and bring the soup to a boil. Reduce heat to medium low and cook for additional 1 1/2 hours, stirring every 30 minutes. Remove ham hock, chicken breast, and bouquet garni. Carefully locate and discard bones and fat. Dice meats fine and return them to soup. Posted on October 23, 2015 by Worth Stopping By . . . This is one of those recipes that is even better the next day. It has lots of great ingredients with a few steps using just one pot. This take on red beans and rice uses most of the traditional ingredients — sausage, red bell pepper, celery, diced tomatoes, tabasco. 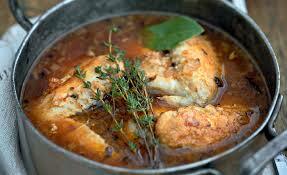 I added some rich chicken stock to the pot along with a bit of brown sugar and some garlic and thyme. Just perfect for the chilly fall days ahead. 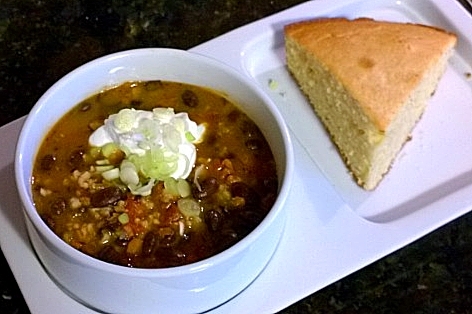 Served here with Sour Cream Cornbread. Saute kielbasa in a large pot over medium heat, 4-5 minutes. Add onion, celery, bell pepper, garlic and seasonings. Cook, stirring constantly 3-4 minutes. Deglaze the pot with vinegar and Tabasco. Add broth, tomatoes, beans and rice. Partially cover and simmer for 25-30 minutes, or until rice is tender. Garnish servings with chopped scallions. Posted on January 31, 2015 by Worth Stopping By . . . I recently bought a couple of rotisserie chickens for a quick family favorite (Chicken Broccoli Divan). After cutting away most of the breast meat I decided to make a nice chicken stock to reserve for the next time I made soup. I particularly like this recipe — I was able to substitute chicken carcasses for the chicken bones, it uses roasted vegetables, doesn’t require a lot of prep, it uses the stems of the parsley leaving the rest for other uses, and I was able to use the bottom end of the celery and save the tops. . . . And of course, I picked through to salvage as much chicken as I could for sandwiches or the pups. Combine onions, celery, and carrots in a pan; toss with oil and season lightly with salt and pepper. Roast until the vegetables are a rich golden brown, about 30 to 40 minutes. Place the chicken carcasses and vegetables to a large stockpot, add 12 cups cold water, and the remaining ingredients and bring to a boil over high heat. Reduce the heat to medium and simmer for 4 hours. Remove from the heat and strain through a mesh strainer into a clean pot. Place back on the stove over high heat and cook until reduced by half, skimming the scum that rises to the top with a ladle every 20 minutes.